Long travel bikes are becoming a norm in the mountain bike world. Advancements in suspension technology and bike geometry has made it possible for long travel bikes to climb just as well as they can descend. The Niner RIP 9 RDO 1-Star Bike is a carbon framed mountain bike with 160mm of travel on the front and 150mm of travel on the rear. The frame of the RIP 9 RDO features Niner's CVA, or Constant Varying Arc, suspension design which lets you climb efficiently and descend smoothly. It features Boost hub spacing on the front and rear that delivers a stiffer and more predictable ride. The frame is compatible with either 29x2.5" tires or 27.5x3.0" tires so you can have the ultimate traction for any terrain. You can route a dropper post internally or externally and the RIP 9 RDO is electronic drivetrain wiring friendly. The 1-Star version of the RIP 9 RDO is built with a SRAM NX1 11-speed drivetrain. It features a SRAM NX1 shifter, NX1 rear derailleur, and NX1 GXP 32T crankset. The rear cassette has an 11-42 tooth gear range which provides enough gearing for most terrain you'll encounter out on the trails. For the suspension, the 1-Star version comes with a RockShox Yari RC Solo Air fork and a Fox Float DPX2 Performance rear shock. It has SRAM Level hydraulic disc brakes that provide confidences inspiring stopping power for any descent and they are paired with a 180mm rotor on the front and a 160mm rotor on the rear. The KS Lev SI dropper seat post allows the rider to be able to climb efficiently and descend with a lower center of gravity with just the press of a switch. 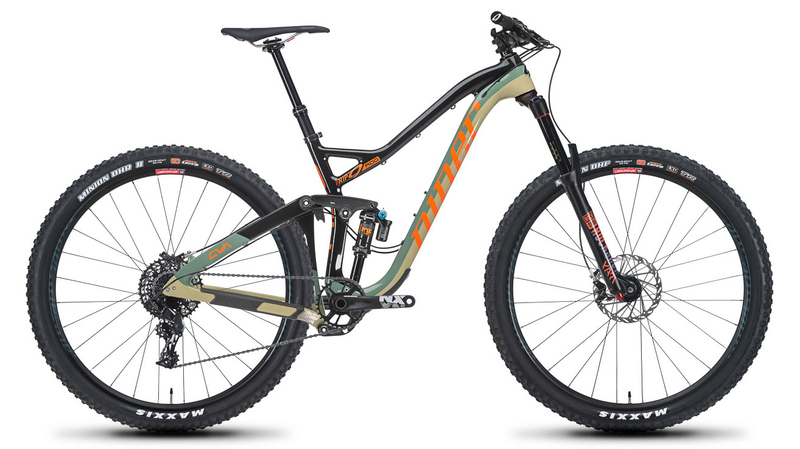 If you're looking for a do-it-all trail bike, then you'll love the Niner RIP 9 RDO 1-Star Bike. Maxxis Minion DHR II 29x2.4"